Exotic Vinegar Flies Invade California After World Tour : Goats and Soda One critter traveled around the globe from Australia on a eucalyptus tree. The other hitched a ride on a Central American flower. These flies are the tip of the invasive insect iceberg in California. Welcome to America! Before it was spotted in Los Angeles, the fruit fly species Drosophila gentica had been seen only in El Salvador back in 1954. Here at the Goats and Soda blog, we talk a lot about tiny critters moving around the globe — and often causing trouble. Last summer it was Ebola hopping on a plane to Texas. Then a painful virus from eastern Africa, called chikungunya, found its way to Florida via the Philippines and the Caribbean. But it's not just viruses and microbes that take advantage of Boeing 747s, vacationers and international development. Scientists in Los Angeles have found two species of fruit flies — also known as vinegar flies — that hitched a ride on plants to cross international borders. And now those bugs call California home. One fly traveled around the globe from Australia on a eucalyptus tree. This critter has also set up shop in Madagascar and South Africa — which, like California, have introduced and cultivated eucalyptus trees. The second fly came from Central America on a fragrant flower, called night-blooming jessamine (Cestrum). "Could be someone just brought up some plants from their hometown or backyard," says Brian Brown, an entomologist at the Natural History Museum of Los Angeles County, who contributed to the study. 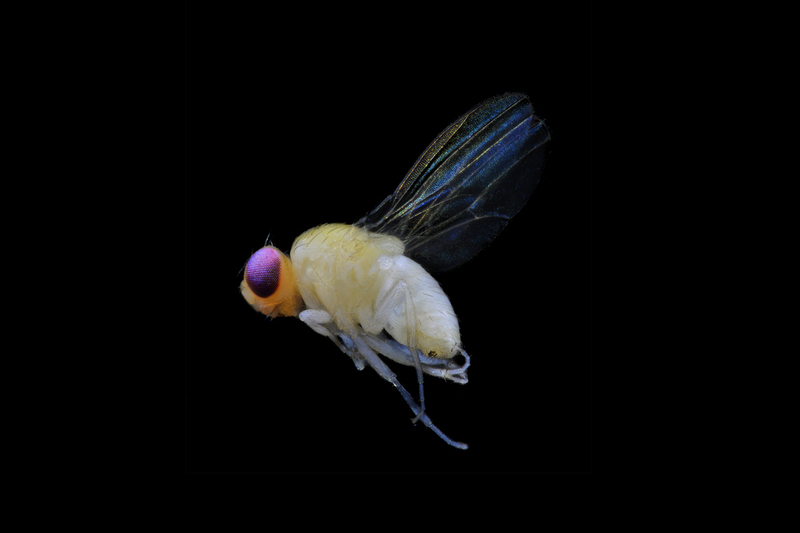 Last month Brown and his colleagues described the discovery of the two exotic flies in the journal PLOS ONE. Volunteers found both of the flies in their backyards, using traps. And these critters are just the tip of the invasive insect iceberg in California, Brown says. "There's almost a new species of insect introduced into the state each month," Brown says, because so many people are bringing plants, food and their belongings into the state. "It's really amazing to go to meetings at the agricultural commissioner in Los Angeles County," he says. "You get the impression that every tree in Los Angeles is doomed because of invasive insects. These things get around." Anyone who has left out an apple on his desk too long — or forgotten to take out the compost bin — is all too familiar with fruit flies. About the size of a sesame seed, fruit flies are barely visible as they fly around your kitchen or up your nose. The most common variety of fruit flies lays eggs in fermenting fruit. And we're talking about many, many eggs, like hundreds per individual. That's why an infestation in your kitchen can get out of control fast. But the two new flies found in California — Drosophila gentica and D. flavohirta — don't care for fruit. They lay their eggs in flowers. Both flies, Brown says, don't seem to be doing harm in California, at least not to crops. "Who knows how long they've been here," he says. Perhaps more than 100 years. Eucalyptus trees have been in the state since the Gold Rush of the 1850s, Brown notes. But some invasive fruit flies have been major problems for farmers. In California, a fly imported from Japan in 2008 is now a pest of cherries, strawberries, blueberries and other berries. Another fruit fly from Africa found its way to Brazil, where it has become a pest of oranges, peaches and figs. There are more than 1,500 fruit fly species around the world. And don't let their tiny bodies fool you. The males pack a punch: They have the longest sperm of any organism on Earth. One species (D. bifurca) has 2.3-inch long sperm cells. "The sperm of a man 6 feet tall, if proportionate to that of the champion fruit fly, would be about 120 feet long," The New York Times reported back in 1995 when this supersperm was first detected.